“How about we go to Palm Beach today?” Dave asks as I hand him a glass of the dark purple, nutrient-dense smoothie I’ve just prepared. An hour later, we are packing up the car, and he asks if I want my fins. “No, thanks; I’m not swimming in that water,” I reply, remembering the intense shore break at an otherwise stunning, secluded beach. We exit the highway onto an unmarked dirt clearing. We are tossed back and forth in our SUV on the rugged road towards the coast. Once parked, we unload the car and pile our BOB stroller high with an impressive number of miscellaneous items, all seemingly needed by our family of four (five including our dog Bandon) for a day at the beach. We navigate the quarter-mile path through a palm grove that is full of standing water from the rains a couple days ago. Lily begs for her boogie board. She wants to carry it the rest of the way to the beach, and noting the uneven terrain, I tell her she can as soon as she can see the ocean. The trees clear, and she proclaims that the ocean is near. She wraps the strap of the board around her wrist and starts running. She giggles and turns back periodically to watch it trail in the sand behind her. 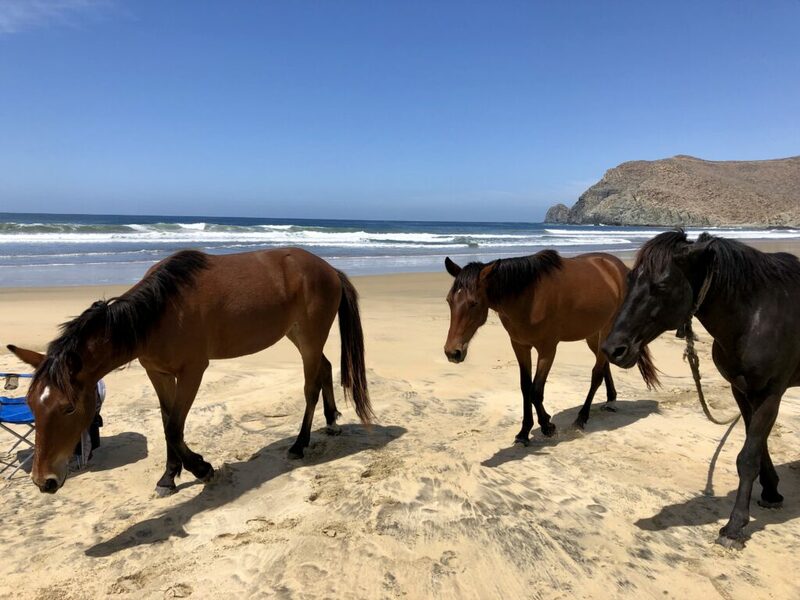 As we set up our umbrellas and chairs, three horses, two brown and one black, walk up to us as if they were just another group of tourists cruising over for a chat. We pet them; I take a few pictures; and we become the fourth group set up for the day on this gorgeous, palm-grove-lined bay. I stand for a moment taking in the magnificence. The group next to us feeds the horses tortilla chips, and I am quite sure one of the guys is trying to give the black horse beer. A few kids are boogie boarding in the shallow water. I remark that the ocean seems much more calm here than I remembered it. Under our umbrellas, Dave and Lily eat carnitas tacos, and then I hand our son to Dave so I can scoop avocado from its shell with Mary’s crackers. As Lily draws shapes in the sand with a stick, I start to tell Dave about a the simplicity parenting philosophy I’ve been reading about. Then, a frantic brunette in a bikini sprints up to us. She is carrying a boogie board under one arm. “Are you missing someone?” she asks in hurried speech. We tell her that we are not. Before she can finish relaying that someone is face down in the rip tide, Dave bolts up. He zips open our bag, grabs his fins and runs towards the ocean. “Be careful, please,” I yell after him as he’s tearing his shirt off. I hug my babies. Lily turns to the sand, starts digging, and makes a castle. About 100 yards away, I watch a man pulling another man out of the white water. Dave throws his fins back up the beach and sprints into the ocean. The two men are now carrying the third, limp, to the sand. The people who had been feeding the horses walk over to where my children and I are. I give my baby to one of the women and phone for help. Between shovels of sand and banter with my daughter, I look up to see Dave kneeled over the body as he delivers chest compressions. We learn that the older woman dressed in black down the beach had been missing her husband who had gone out for a swim. One bystander mentions the couple had walked onto the beach holding hands not long ago. Eventually, Dave pulls back from the body, erect on his knees. The man laid out before him remains motionless. Our dog Bandon who had followed Dave to the water runs up the beach to check on the kids and I and then back down to Dave who has walked over to the new widow dressed in black. Bandon positions himself next to the dead man, as if keeping watch while he transitions. Dave wraps his right arm around the woman and guides her over to her husband’s body that lies about 10 feet from the water’s edge. I assure the five strangers who have gathered around that given the situation, the woman is in the best hands possible. Dave deals with the end of life on a near daily basis in his work, and I know how much care he can have for these moments. The widow, the man who pulled the body out, his wife who had alerted us and Dave sit down around body talking for some time. The paramedics emerge from the break in the palms where the path in is and walk over to the circle. After a quick survey of the situation, one remains and the rest return the same way they came. With Theo in the Ergo, I draw Lily away from her sand castles and into her stroller. I walk her up and down the beach, and she naps. After what is likely a couple hours since his sprint to the ocean, Dave breaks from the group and meets me on the packed sand near the water where I am pushing the stroller. We kiss and reconnect. Dave pushes the stroller over to where the woman is sitting with her deceased husband. He asks if I want to meet her. I sit down with her, offer her a hug and my condolences. She asks for a peak at Theo whose head is covered in the Ergo before the remaining paramedic tells me that I am not allowed to be there. The police are coming. Over the coming hours, Dave continues to tend to the widow. Eventually, the police arrive. We learn that the man was nearly 80, from California, a professor and renowned Mark Twain scholar. As Lily finishes her nap and Dave gives his police report, I lose myself in a moment gazing up the beach. The man’s feet peek out from under the yellow and white striped towel that covers him. His toes point towards the murky rip at the center of this palm-lined bay. His head points back towards the palms where a cross sticks out of the grass 20 feet behind him. The three horses are riled up, one bucks and kicks its hind legs into the other. They gallop back to the grass. When Lily wakes up, Dave takes her over for a last look at them and one nips at him, taking a good bite on his shoulder. We decide it’s time to pack up our items, piling them back onto the stroller. We start the journey back to the car, but 10 yards into the trek, I encourage Dave to return to the widow to make sure we can’t be of more help. She sits with her husband surrounded by police. As he’s talking with her down the beach, a short woman with curly orange hair under a Grateful Dead hat walks out of the palm grove towards us. She carries a plastic beach bag, in it a mask and snorkel on top of a towel. She looks around and asks if I speak English. When I say yes, she asks why the police are here. I tell her that a man died in the rip tide earlier. She looks perplexed and tells me that she was told this is a swimming beach. “So, maybe I should just go in to my knees then?” she says as she rubs the top of her shin. Dave returns, telling me that the woman is going to be okay on her own. She is very capable; he is impressed by her level head. I push Lily in the stroller towards the path back to the car. As we walk through the palm grove, the coroner arrives. His car stops abruptly a couple yards from the BOB. We keep walking to our car. Those first moments driving back home on the unkept dirt road are dense. There is so much to say and nothing all at once. On which side do you lean – that this was all pure coincidence or do you think it’s possible that man’s spirit knew that this was his day to go home, so he asked yours to have you there to be with his wife? such amazing words, stephanie. thank you for sharing in such a vulnerable, honest, beautiful way. hugs and love to you and your precious family. Thank you for reading and taking the time to write, Kim! I appreciate your feedback. Love to you and your as well. Absolutely beautiful Stephanie! You captured details that I will carry with me. ugh my heart goes out to that woman, and to you guys. That beach always scares me, and whenever Eben or the kids are in the water (just up to their knees) I still hold can’t relax until everyone is out and safely on the beach again. I know the feeling, Genevieve. 💛 Freedom and vigilance can be close neighbors. Tears roll… thank you Stephanie for sharing so elegantly. Wow. May I share this?